Cancun, Mexico, Dec 2, 2010 — Indigenous Peoples of Canada and their allies from around the world are in Cancun at the COP-16 climate summit demanding real action to reduce fossil fuel pollution. Over twenty people with color-coded T-shirts that spelled out the words “Shut Down the Tar Sands” in both English and Spanish gathered in front of the Maya building to directly deliver their message to UNFCCC delegates. Participants included Indigenous community representatives from fossil fuel impacted community across Canada and the U.S., many carrying personal banners linking tar sands with the destruction of their territories. Copenhagen day one: Scandal! Bullying! Well it was opening day of the madness that is COP15: the meeting of the UNFCCC that is supposedly going to decide the fate of the entire world. And what better way to open it than with broad civil society outrage at the egregious lack of democracy in the process. Here’s the inside scoop: the Danish presidency is desperate for a positive spin on any outcome of the climate negotiations here. That means forcing an outcome by bringing together the rich and powerful nations to broker a deal in private and then to announce it to the rest of the world. There is widespread concern of US-friendly text being “parachuted” into the negotiating documents, at the expense of G77 countries (everyone else). We all know that international agreements involve quite a lot of back-room deals and often intimidation. We just usually don’t expect it to come from the facilitators. Obviously this is both antithetical to the UN process but also to the duties of the Danish Government in playing a neutral convening role at the Conference of Parties. It’s not just an attack on democracy, but it amounts to an attack on the rest of the world on behalf of a few powerful interests. It’s the sort of “green room” behavior one would expect from the World Trade Organization, not the United Nations, which has a consensus process designed to make global decisions. The logic is this – the US needs to be on board to get any deal, so therefore let’s force a watering-down of the process to get the US to sign. Déjà vu? It’s errily like we’re replaying the Kyoto meeting in 1997. Remember how the world watered down the treaty (giving birth to the concept of offsets and the Clean Development Mechanism) so that the US would sign? …and the US never even signed anyway. Think Climate Finance is boring? Think again. Remember when the World Trade Organization, the World Bank, and International Monetary Fund were constantly making global headlines for their fierce opposition from people’s movements around the world? Well, international Finance Institutions (including the World Bank) are rearing their ugly heads again – this time with the U.N. as their vehicle. 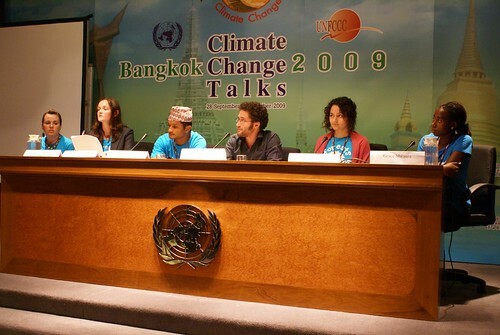 Today, more than 50 social movements, trade unions, environmental groups and NGOs from 17 countries issued a statement at the United Nations in Bangkok, where UNFCCC climate negotiations move into their fifth day. And they’re right. 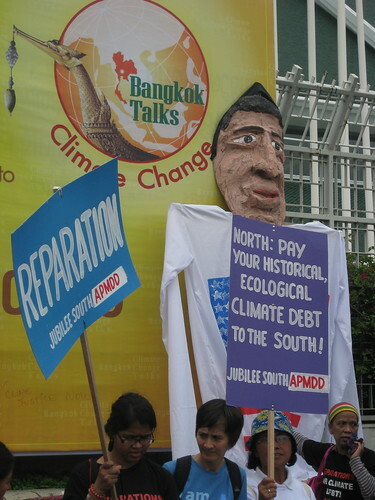 As colleagues here in Bangkok talk about their newly-homeless families from the floods earlier this week in the Philippines, it is undeniable that the economic prosperity of the North is the gift-that-keeps-on-giving to the South – this time around in the form of devastating climate change. Tom Pickens from Friends of the Earth described it like having a fancy four course meal in an expensive restaurant – and then forcing someone walking by on the street outside to pay. Reparations must come from public sources. 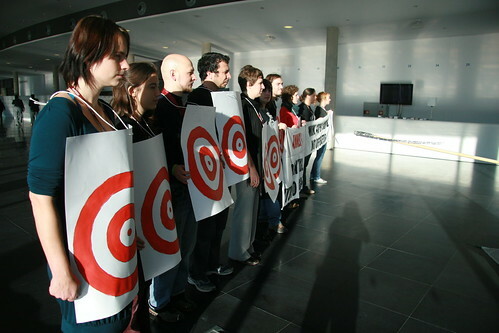 These views are similar to those of the G77 plus China group, a bloc of more than 130 developing countries in the climate negotiations that considers the World Bank inappropriate for channeling developed countries’ financial obligations under the Convention – largely because of its undemocratic and unaccountable governance structure. Whew. United States, ready to listen yet?